Showing 29 articles from April 14, 2014. SOUTH BEND – The Pacific County Commissioners gathered on April 8 to hold a regular meeting that lasted 25 minutes and dealt with no less than 21 agenda items. 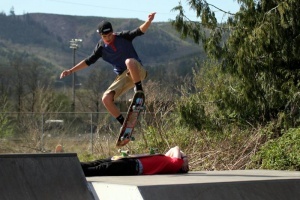 Tristan Hansen pulled off some fancy moves while longboarding at the 8th Street Park in Raymond Saturday afternoon. Hansen flew over Chris Jerles, senior at SBHS. Hansen is a junior at SBHS. 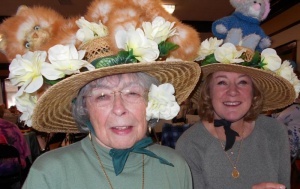 Betty Wicklund of South Bend and her daughter, Susan Tuttle of Vancouver, wore cat and mouse hats for a fun “best hat” contest at HAVA’s Spring Tea last Saturday. The Willapa Harbor Community Center in South Bend was packed for the afternoon event. The annual tea raises funds for HAVA’s many programs, including Harry’s House in Raymond, a spay-and-neuter program and taking care of “jetty cats” in Westport. Quick response and sound judgment by law enforcement may have prevented a huge disaster after several police and deputies converged on a shooting incident that turned into a suicide at a RV park in Long Beach last Monday (April 7). The man had barricaded himself inside his residence and fired a gun. During the April 7 Raymond City Council Meeting, general city business was sandwiched between an almost hour-long discussion on the current business of medical marijuana. The Friends of the Castle Rock Library will be holding their regular book sale this Friday and Saturday, and residents from all over the area are invited to come and support this vital fundraiser. Taking place from 11 a.m. to 6 p.m. Friday, April 18, and from 10 a.m. to 3 p.m. Saturday, April 19, the sale will feature a number of books and movies at reasonable prices, all of which are being sold to support the ongoing activities of the Friends program. Hardcover books will be $0.50 each, paperback books will be $0.25 each, children’s books will be as low as $0.10 each, DVDs will be $0.50 each and VHS will be $0.25 each. A long-standing discrimination suit against the Ryderwood Improvement and Service Association (RISA) may soon be settled prior to trial, according to a recent report filed in US District Court. Though the suit, filed July 8, 2009, had been scheduled to go to trial on Tuesday of this week, a pretrial conference held April 8 tentatively rescheduled the trial for April 29 after parties involved “advise[d] the Court that settlement negotiations are ongoing,” according to the court’s summary of the conference. With Easter approaching this Sunday, Town Crier is pleased to feature a list of local churches as well as Easter events in our area. Local volunteers had their first dry Clean Up the Coop event this Saturday and were able to tackle a number of long-standing projects around town. Part of the monthly cleanup efforts of the Winlock Cleanup Committee, April’s cleanup day found volunteers spending time in Winlock’s downtown core, as well as spreading to the nearby business district on Cedar Crest Dr.
After a full day of work, Castle Rock's Jackson Hole looks very little like its former self thanks to the efforts of volunteers both local and regional. 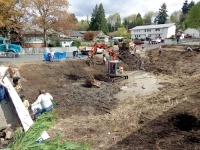 Part of a series of beautification projects begun since 2012, Jackson Hole, a storm water retention pond located on Jackson St. by Cascade Select Market, had merely been a large ditch overgrown with wild grasses and a sickly willow tree, but was transformed Saturday into the start of a wildlife habitat through the efforts of City Hall, local students, Cowlitz County AmeriCorps and other community groups. For a trip down memory lane, drive up Morse St. past the Library in Ryderwood to see the newly cleaned “Old Ryderwood Sign,” recently mounted on the newly-cleaned Red Barn. It is the earliest "Welcome" sign in local memory, and mild cleaning has left it in remarkably good condition. Summer weather caused all of our beautiful red tulips in the downtown area to show their pretty colors this week, but the first red tulip opened in front of LACEY RHA'S CAFE. Joy Parker won $22.00 by choosing that location. In all, The Red Tulip Event raised $426.00 for 2,500 tulips to add to our beautiful displays all over the city. Did you see our new business across from LACEY RHA'S CAFE? We have a really interesting new shop called, LUTTRELL'S FIVE AND DIME that has opened at 27 Cowlitz Street West. IT'S GOT A LITTLE BIT OF EVERYTHING, so stop in and talk to Owners Todd and Pam Lutrell, and hear why they committed to our city. Friday night’s dinner will be served in Community Hall at 5 p.m. The meal will be Beef Stew with rolls, pineapple-upside-down cake and beverage for $6. Tuesday ARTrails 2014 meets 6:30 p.m. at Morgan Arts Centre. Visit www.morganartscentre.com or call (360) 864-4ART. Wednesday Toledo New Life Assembly invites all children, toddlers through fifth grade, to the Fourteenth Annual Community Easter Egg Hunt. EGGstravaganza begins 6 p.m. at church, groups escorted by age to hunt eggs at Toledo Middle School across the street. Note: April 23 regularly-scheduled Wednesday Night Dinners will resume at church, 420 Silver St. Contact office, (360) 864-4366. City Councilor Andy Wilson celebrated his 89th birthday last Thursday. This long-time resident of Vader has been holding public office for close to three decades, and those who see him around town should remember to say "Thanks!" and "Happy birthday!" The Vader Lions Club will be hosting their annual Easter Egg Hunt Saturday at 1 p.m. in the field by the post office, or at the Lions Hall if the weather does not hold out. This free event is open to all families and separate hunts will take place for children 4 and younger, 5-8 years old, and 9-12 years old. Refreshments and prizes will be available, and be sure to show up on time as this event is over very quickly. Spring has definitely sprung in Winlock, we had great weather this past week. This is when I appreciate living in the Northwest. With the opening of the Winlock Historical Museum from its winter slumber, I thought it was time for a little bit of history of Winlock. The Museum will open on May 1 and be available Wednesdays from noon to 4:30 p.m. It had been a while since I have read the history and when I do I always find it quite interesting. Bill Wall wrote the history and I hope many of you enjoy it as much as I have over the years! 1871 - Christoppher C. Pagett was the first settler in Winlock. Pagett bought 80 acres from the U.S. Government on the east side of the proposed railroad track. In July 23, 1871 A.J. Flesher married Nancy Broshears. John Raymond Boyer, of Winlock, died April 2, 2014. Born Jan. 23, 1952, he was 62 years old. He was preceded in death by parents Raymond and Margaret Boyer, and sister Tony. The Cowlitz Indian Tribe has tentatively been granted a Gaming Compact by the State Gambling Commission to build a casino on tribe-owned land near LaCenter, though development of the property remains contested in federal court. The commission announced April 8 the proposed compact would allow up to two facilities featuring “Las Vegas-style” gaming, and a hearing has been scheduled for May 8 in Tumwater to take testimony regarding the compact. The Vader City Council has chosen to use the contracted planning services of Rob White, with North Creek Consulting, in a move Mayor Ken Smith said will bring the city’s outdated ordinances into the 21st Century. Vader had been advised by City Attorney Carol Morris in January of the need for a planner, given its efforts to strengthen nuisance laws as well as a number of ongoing lands use and zoning issues. Morris had specifically recommended White based on his performance as a planner for the City of Ruston and his reputation within the industry. Willapa Valley won again in boys golf with a 61 stroke win over North Beach on sunny conditions at North Beach last Thursday. Nicholas Betrozoff continued his stellar play with a round of 39 for medalist honors. Photo by Larry Bale...Raymond's Hannah Dykes won the triple jump at RHS last Thursday. Raymond hosted seven schools with the Seagulls taking first place in the boys' competition and Willapa Valley winning the girls meet last Thursday. To look at Toledo High School Senior Pascal House, one would think that he has to be an incredible athlete. The truth is, House is the beat for several bands rather than banging pads on the football field or pinning opponents on the wrestling mats. House was making noise as a talented wrestler as a freshman, but a car accident in October, 2011, put the brakes on what might have been a glorious high school wrestling career. A rundown of local games for the week of April 7. No individuals were injured, despite the loss of livestock, when a barn caught fire near Winlock Saturday, according to the Lewis County Sheriff’s Office. At around 8 p.m., a deputy passing through the 200 block of Tennessee Rd., north of Winlock, observed a barn fully involved in flames. Local EMS and fire calls between April 7 and 13. Fighting fires is no easy task, even if your only job is to make sure you’re available at all hours to jump behind the wheel of an engine. Those who venture into a burning building have it especially tough, and preparedness is crucial to making sure they can venture back alive. It was with that spirit Lewis County Fire District 2, of Toledo, hosted a live fire drill on Saturday to remind experienced firefighters what it’s like confronting an actual blaze, and to inform newcomers what it takes to put their own safety on the line to help others. Mike Schroeder, South Bend eighth grade teacher and Civil War re-enactor, dressed in period uniform and carried a 9-pound rifle during a presentation at the First Lutheran Church in South Bend April 6. Schroeder shared little-known details about the war. 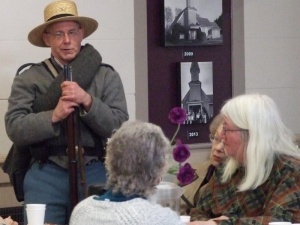 Mike Schroeder, South Bend eighth grade teacher and Civil War re-enactor, dressed in period uniform and carried a 9-pound rifle during a presentation at the First Lutheran Church in South Bend April 6. Schroeder shared little-known details about the war from the perspective of a Confederate soldier. Starting this Saturday, Sterling Bank will officially become Umpqua Bank, and services to former Sterling customers are expected to continue without interruption. The Boards of Directors for Umpqua and Sterling had agreed to a merger last September in a move expected to double the branches and customer base of both banks. 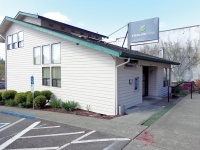 Former Sterling branches will now operate under Umpqua Bank's name and brand, making Umpqua the largest community bank on the West Coast, according to recent news releases.